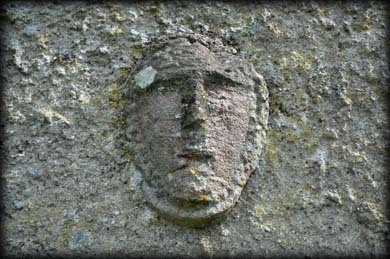 The Augustinian Abbey complex at Fethard was founded in c.1306 on land granted to them by Walter Mulcote. 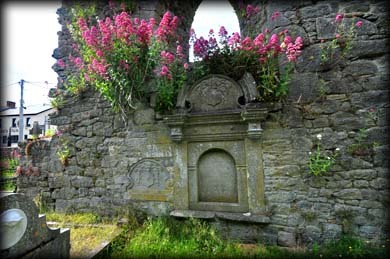 The friars remained at Fethard until the dissolution of the monastery in 1540. All that remains of the complex today is a multi-period structure that was substantially rebuilt as a Catholic Church in 1823, shortly after the friars returned to Fethard. This nave and chancel church is 38 metres long and had a Lady Chapel running at right angles from the north wall, see top image. 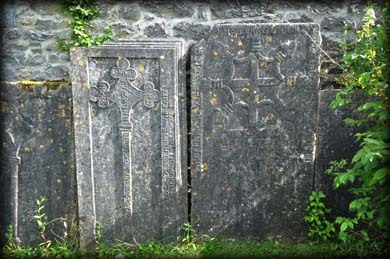 Lying against the external north gable of the, now roofless, ruin of the chapel is a wonderful selection of 17th century graveslabs. There is another chapel attached to the south wall of the chancel. I was unable to gain access to the church on this visit but I am looking forward to viewing the interior on my return to Fethard. I believe the are some excellent original carvings inside the church. There are several masks inside the church. The south wall features a fine stained glass window designed by Harry Clarke. The sculpted head, pictured left, is on the north wall of the modern sacristy. 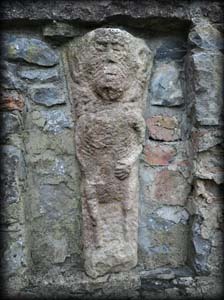 Do not forget to view the sheela-na-gig located on a wall extending east from the church. Situated: At the east of the town on the corner of Abbeyville and Abbey Street, just a short walk from the Main Street. Discovery Map 67: S 2102 3499. Last visit June 2015.